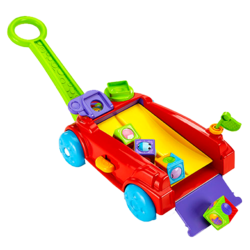 This wagon is packed with rockin' ramp action, music, silly sounds, stacking fun and roller block play! It even grows with baby! 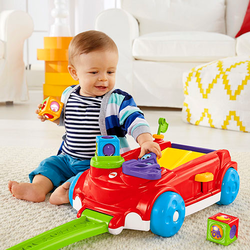 The Fisher-Price® Roller BLOCKS Rockin Wagon gives baby 2 ways to play! 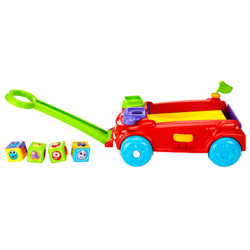 Entertain the youngest babies in Sit & Play mode with a clicker wheel to stack the roller blocks, a peek-a-boo flipper to flip blocks onto the wagon's rockin ramp, and flag with noisy clacker bead. Mom can keep the tailgate up to contain the play for the littlest ones. When baby's crawling and on the move, mom can flip the tailgate down so the blocks race out the back for baby to chase! And by pressing the lever, baby is rewarded with teeter-totter action, music and silly sounds! When baby's ready for Stand & Pull mode, simply unfold the handle from underneath. With fun music that plays and blocks that teeter-totter back and forth on the ramp when the wagon's pulled along, baby will be encouraged to walk! This wagon's definitely rockin' with non-stop fun and roller block racin' action! All the fun of a classic wagon, with the stackin', racing action of roller block play! 2 ways to play as baby grows! Sit & Play: Stacking fun, rockin' ramp action, spinning clicker, peek-a-boo flipper, and flag with clacker bead. 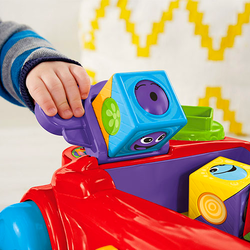 Baby can press the lever for fun music and sounds as the roller blocks race back & forth! Flip the tailgate down to send the blocks racin' out the back for baby to chase! Stand & Pull: Baby is encouraged to walk with playful music and rocking & rolling roller block action as the wagon is pulled along! Music and bright colors help stimulate baby's visual & auditory senses!